Send a birthday cookie cake! 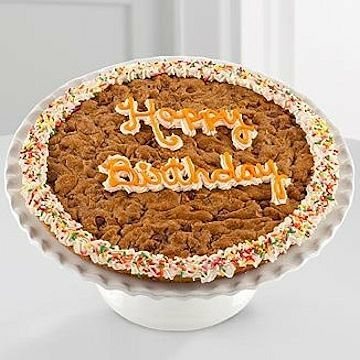 Make their birthday memorable with a Mrs. Fields® moist and chewy, colossal big cookie cake. It is made with real butter, whole eggs, and pure vanilla. Eat it with a fork or fingers, on plates, napkins, or right out of the box. Any way you slice it, this Happy Birthday Big Cookie Cake is still first in flavor. * 12 inches, serves 10 - 12 people.